American producer Anderson .Paak and rapper Kendrick Lamar appeared on Saturday Night Live, where they performed “Tints” and “Who R U?”. This marks Anderson .Paak's musical guest debut on Saturday Night Live. “Tints” was released back in October and received its firs play during Zane Lowe’s Beats 1 Radio show. The song marks the third collaboration between Anderson .Paak and Kendrick Lamar. Anderson .Paak said of the song, "I love working with him. Some people you can trust to just send it and they gonna send it back and it’s gonna be flames. I just knew that would be the case with him (Kendrick Lamar). I’d been sending him tracks through the recording process and I had no idea this was gonna be the one and all of a sudden I looked at my phone and had something on iMessage and he said ‘I gave this one a shot.’ I sent him five or 10 tracks man. I love that he got on this one it’s so perfect"
“Who R U?” was released on November 9th. It was written by Anderson .Paak, Syd, Om'Mas Keith, Jeff "Gitty" Gitelman, Robert Lewis, Pomo, Tayla Parx and Kendrick Lamar. 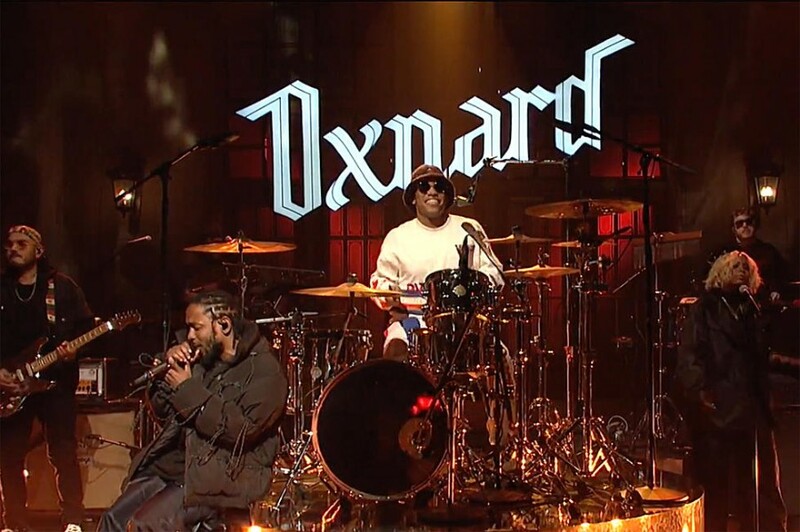 Both of the song appeared on Anderson .Paak's third studio album "Oxnard", which was released on November 16th.